Very Good. 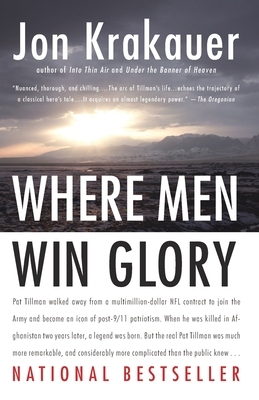 Where Men Win Glory: The Odyssey of Pat Tillman by Krakauer, Jon. Trade paperback (US). Glued binding. 480 p.
Good. Where Men Win Glory: The Odyssey of Pat Tillman by Krakauer, Jon. Trade paperback (US). Glued binding. 480 p.
Very Good. 400 p. Where Men Win Glory is a profoundly eloquent and affecting account of heroism-a millionaire sports star who gave it all up after the terrorist attacks of 9/11, to fight for his country with the US Army in Afghanistan: only to be killed by one of his own platoon. The gripping story of the life and death of a true American hero. of courageous, idealistic, and selfless individuals. Well written and meticulously researched journalistic account of the story of Pat Tillman-as naive pawn in Army's Public Relations juggernaut. Well-written, inspiring, book about the too-short life of Pat Tillman. his sense of duty and how/why his life was cut short. Every young man or woman who considers joining the Army should read this first. Informed consent. This book upset me more than any story in recent memory. Perhaps my entire life. That a man, attempting to do the right thing, can be so thoroughly betrayed?by his leaders, his commanders and ultimately his own fellow soldiers?depressed me to no end. Is it any wonder that the modern male has become cynical and disengaged when the other option is to be thoroughly ?snafu-ed? by your country? Being an Arizona football fan, I was well familiar with Pat Tillman?a standout at Arizona State and then the professional Cardinals. Pat played football the way fans love to see it played?all out. He was not one of the bigger, faster or most gifted athletes, but he more than made up with it with sheer passion. The book explores this complex man?s personality and drive in depth. He was sometimes a typical alpha male?full of bravado and risk-taking, yet he also had an almost embarrassingly sensitive side, an introspective mind and an independent streak a mile wide. He eschewed material wealth which made it easy for him to walk away from the huge pro football contract. Mr. Krakauer does a commendable job interleaving Tillman?s life with the politics of the US and Middle East that would ultimately decide his fate. The fact that Tillman ultimately died of friendly fire does not automatically condemn the military, but the specific causes of this one incident and the resulting obstruction and cover-up certainly does. As Mr. Krakauer himself concludes, ?Pat Tillman understood that outside the wire, bad things happen. But he was an optimist. Archetypically American, he was confident that right would usually prevail over wrong. When he swore the oath of enlistment in the summer of 2002, he trusted that those responsible for sending him into battle would do so in good faith. At the time he didn?t envisage that any of them would trifle with his life, or misrepresent the facts of his death, in order to further their careers or advance a political agenda.? Personally, I?d make this a must read in every high school civics class. Of course it?d raise hell with Army recruitment quotas.